Current industry politics within Hip-Hop has made it increasingly difficult for MCs having two x chromosomes to prosper at greater numbers. One of the few women that’s been given wholesome respect on par with male peers is non other than Snow Hill, N.C. native Rapsody. How far does that respect go? She’s found herself collaborating with some of Hip-Hop’s greatest including Kendrick Lamar, Mac Miller, Big K.R.I.T., Raekwon and Wale. Plus, she’s done it by being 100 percent herself. 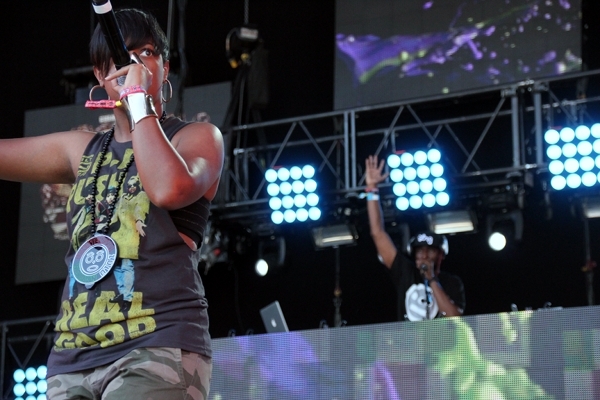 This is the same MC that proclaimed “We can’t afford Maybach, we in Accords.” Rapsody has come a long way from co-founding Hip-Hop collective Kooley High to being one of the brightest MCs to come from 9th Wonder’s Jamla Records imprint. 2012 even saw Ms. Evans (first name Marlanna) release two critically acclaimed projects through The Black Mamba EP and full length debut The Idea of Beautiful. Now that she’s solidified herself a spot on the table of rap’s elite lyricist, Rapsody has decided to pull in bigger muscle with the Gangsta Grillz presented She Got Game hosted by DJ Drama. Starting with her debut mixtape Return of the B-Girl in 2010, Rapsody has continued to evolve and Wale assisted single for She Got Game “Dark Knight,” she isn’t stopping anytime soon. Rapsody took time to speak with me about her upcoming project with DJ Drama She Got Game and some of her biggest fan moments.